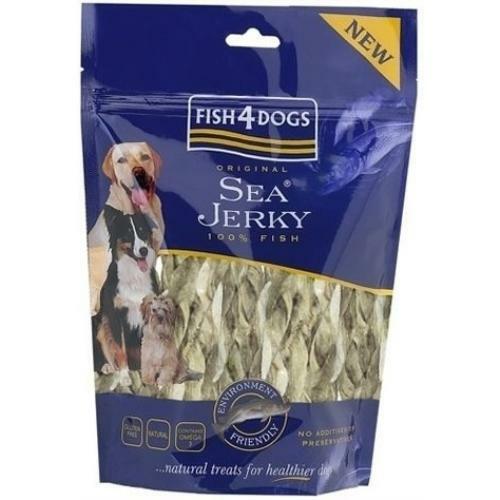 Fish 4 Dogs Sea Jerky Fish Twists are made from 100% fish skins these natural healthy treats have a rough texture which helps remove tartar from your dog’s teeth. Sea Jerky Fish Twists are fish chews made from twisted pieces of fish skin that can be held in the paws. Omega 3 and other fish oils to help promote a healthy coat and supple joints. Omega oils have been shown to improve concentration and temperament. Feed up to 5 treats a day depending on the size of your dog. Sea Jerky Fish Twists are a natural product and by nature may vary in size. Current stock is 130mm long by 25mm wide and 14mm deep. Suitable for all sizes of dog!